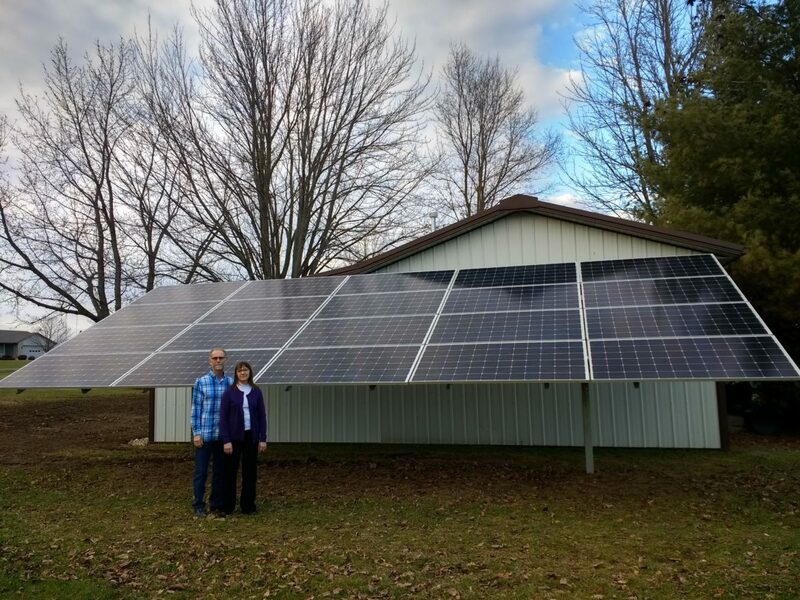 Michael and Beth Grieser got a 7.6 kW, 20-panel ground-mounted array through Solarize Indiana. Solar installers in two Indiana communities rushed to finish projects before a state law limiting net metering took effect Jan. 1. The deadline was fast approaching, and Brian Burkholder and his team at Solar Energy Systems in Northern Indiana rose to the challenge. A state law passed last year phases out net metering, and only solar installed by Dec. 31, 2017, was grandfathered in to receive retail rates for energy sent back to the grid through 2047. Anyone who missed the deadline by even a day can only net meter until 2032. So despite frigid and snowy weather, Burkholder and his employees worked hard — some skipping family vacations — to install as many systems as possible before the end of the year. “They shoveled the snow off our roof and went right to work, with the temperature around 10 degrees, the windchill zero degrees. It was impressive,” said Joshua Weaver, a Goshen, Indiana, high school math and social studies teacher whose installation was done by Solar Energy Systems on Dec. 30. The spike in installations was made possible largely by Solarize Northern Indiana, a group-buy program that made installations more affordable and helped would-be customers through the process. Solarize coordinator Leah Thill said the program has meant the installation of 97 projects, with 76 of them representing 536 kilowatts installed in 2017. The program focused on Goshen and South Bend, bringing the Goshen area’s installed capacity up to 486 kilowatts and South Bend to 165 kW, with another 55 kW of solar capacity in other Northern Indiana towns. Weaver’s family is Mennonite — his wife is a pastor — and for them and others in their community, solar energy is in keeping with their faith and taking care of God’s creation. Solarize volunteer Jerry Mohajeri, a founder and former board member of the Islamic Society of Michiana, likewise sees solar energy as an expression of faith. The Islamic Society installed 20 kW of solar in 2016 with the help of a $24,000 grant from Hoosier Interfaith Power & Light. He said the society has already earned back more than $4,300 through net metering. Burkholder is Amish and has installed solar for many Amish families,who see solar as a way to be self-sufficient and supplement gas-fired generators. Amish households are typically not connected to the grid, in which case the net metering deadline does not affect the economics of installing solar. The Solarize Northern Indiana group-buy makes both grid-connected and off-grid systems more affordable. As with most group-buys in other states and cities, group-buy contractors — like Solar Energy Systems — install panels for below market rate. The average cost of an array under Solarize is $2.53 per watt for a basic 5 kW system, compared to about $2.80 per watt on the open market, according to a report by Solarize. Burkholder said in a statement that working through the program is much more efficient because — thanks to the legwork of Solarize volunteers — customers are already educated about their options when he meets them. “This was a much easier process with having knowledgeable people to ask questions of and guide us through the process,” noted Beth Grieser, a teacher who along with her husband got a 7.6 kW, 20-panel ground-mounted array through Solarize. While the group-buy is now closed, more than 20 projects contracted under it are scheduled for installation in 2018. Meanwhile, a state bill has been introduced by Rep. David Ober (R) that would extend net metering until 2037, rather than 2032, for schools and municipalities that didn’t make the 2017 deadline. Phil Sakimoto did not get his installation up before the deadline because he is doing ground-mounted solar and the earth was frozen too solid for construction in December. But he’s still eager to get solar panels through the group-buy, and he expects to earn back his investment with net metering in 14 years or less. Sakimoto doesn’t think it’s wise to mount panels on the roof of his older house, so he decided on a ground-mounted installation that will also shade a sun porch that gets too hot. “This is going to be great, I get my solar panels and awning all at once,” said Sakimoto, now a professor in the physics department and director of academic excellence at the University of Notre Dame. He is also working with Solarize to educate people about solar, and convening conversations at his church, where a solar installation could be in the works.